Launch party info and BETWEEN preorder giveaway! Between comes out in less than 100 days. 98 days to be exact BUT WHO'S COUNTING?! First off, I wanted to invite everyone to Between's launch party. It will be Saturday, August 2, at 4:00pm EST, and my favorite local indie store, Morris Book Shop, is hosting it! If you live in the area or feel like taking a road trip, I'd love for you to attend! I'll be posting about it on my Facebook page, so if you haven't liked it already, now's a good time to do so. So I've been thinking it would be fun to do pass out some bookmarks!!! Here's the deal: everyone who preorders a copy of Between will get a signed bookmark. All you have to do is send me proof of your preorder (you can screen cap it on Amazon or wherever you've preordered it) to meganwhitmerwrites (at) gmail.com. This is open to every single person who's preordered the book, even if you did it months ago. This giveaway will run right up until release day, July 29, 2014. 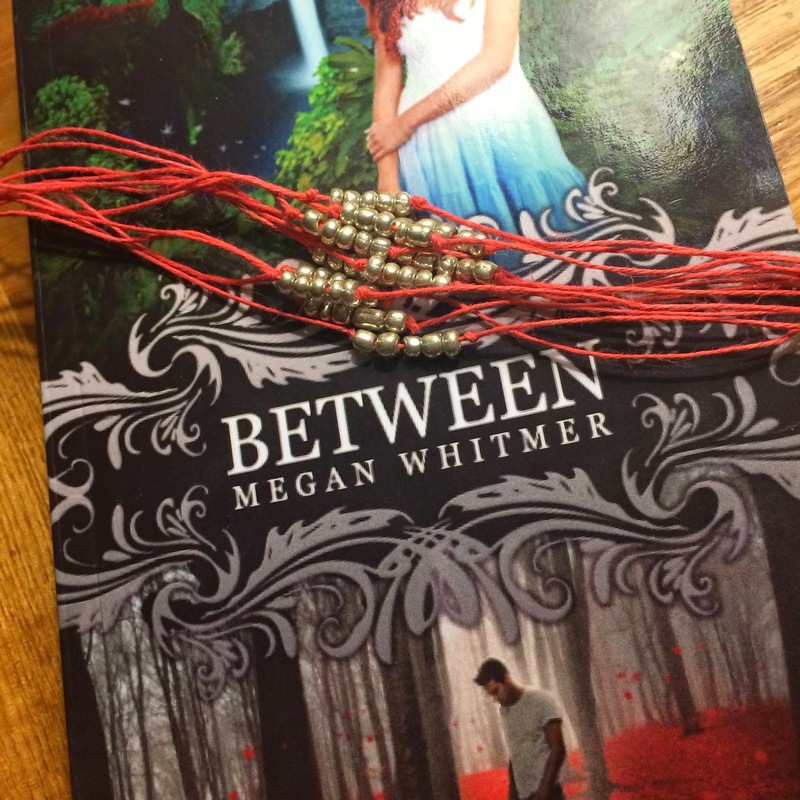 At the beginning of Between, Charlie's brother, Sam, gives her a red string bracelet with five beads on it. This is my attempt at an artsy photo of these bracelets. Just go with it. I've made fifty of these bracelets. The first fifty people to send me proof of their preorder will also get one "Charlie" bracelet in addition to the signed bookmark! YAY FREE STUFF AND SWAG AND PREORDERS AND CAN WE ALL JUST TAKE A MOMENT TO BREATHE BECAUSE SERIOUSLY 98 DAYS. I feel like for the next 98 days "all caps and exclamation points" is going to become my signature formula for blogging, tweeting, talking, you name it. Please forgive me. To everyone who has preordered Between (or plans to), thank you so much. I love you and I cannot even begin to tell you how much it means to me that you took the time to check out my book. You're all the absolute BEST. NOTE: If you are planning to attend the Between launch party and want to have your book signed, you'll need to purchase it at the launch party. Just letting you know! ONE MORE NOTE: I've had lots of people ask if it makes any difference to me if my book is preordered or bought after release, or if it matters where the book is purchased--it doesn't. However, I'm always going to ask you to support your local indie bookstores. If you don't know yours, you can go to www.indiebound.org to find the nearest one. I WILL say, and I'll do a post on this later, that the first week after a book is published is a big week--everyone's paying attention to the numbers and the more sales you have, the better. Preorders count toward first week sales (and if you buy the book at the launch party, it's in that time frame as well). BUT- overall, I'm just insanely excited that anyone wants to read my book enough to buy it, and I don't care when or where you do so.